Last Minute AC Repairs to Be Aware of | AAction Air Conditioning & Heating Co.
Winter weather is slowly but surely coming, with nighttime temperatures already pretty chilly! Chilly enough that you may even be using your heating system already. In fact, you probably aren’t going to be using your air conditioner at all as far as this year is concerned. But what if your air conditioner wasn’t exactly working perfectly the last time that you did need to use it? Can you just wait until next spring to have it repaired? You could, and technically you could also drive a car around the block a few times on nothing but the rims. In other words, it’s a bad idea. 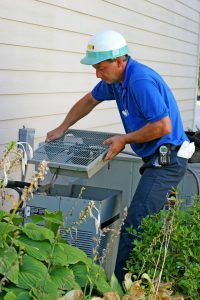 It’s never wise to let your air conditioner sit in a state of disrepair all winter long, as much of a nuisance as it might be to schedule last minute AC repairs when you don’t really “need” them right away. Keep reading for some last minute AC repairs you may need and why it’s a good idea to manage them now. Air conditioners go through a lot of work for our hot and muggy summers. As a result—and this is especially true for aging systems and/or AC systems that haven’t had maintenance in over a year—it can accumulate a lot of wear and tear in just one season. For instance, you may have a loose or worn down component making some noise like banging or clanging. Or, you could have refrigerant leaving your system, which means you have a leak (despite a common misconception that air conditioners burn up refrigerant—this just isn’t true!) Both of these problems can be detrimental to your air conditioner if you ignore them and let them wait, especially if you have a heat pump system that provides you with both cooling and heating. The bottom line is that any repairs you need are only going to worsen the longer you force the air conditioner to either sit in wait, or run. If temperatures begin to rise a bit sooner than you expected next year, or we have an unseasonably warm heat wave this winter, do you really want to be stuck with a malfunctioning cooling system? Tackling Repairs Now is Convenient for You! Your air conditioning system and its problem will still be there when temperatures rise again next spring, so you may figure you can just wait until then to have them repaired. But then you run the risk of trying to schedule air conditioning repairs just when HVAC contractors’ services are in highest demand. This means that you, unfortunately, may need to wait in discomfort until someone can get out to repair your AC. If it’s broken down completely, this is definitely not convenient! When spring does roll back around, hotter temperatures can hit hard and fast, so any wait time can feel like an eternity. Scheduling your AC repairs when you don’t actually need your AC ensures that your comfort won’t be compromised. When you’re looking for professional services for your air conditioning in Hilton Head, seek out a company that will do a quality job at a fair price. Contact AAction Air Conditioning & Heating today!